Donald Trump is widely seen as having little or no respect for Muslims, women, Hispanics and blacks. 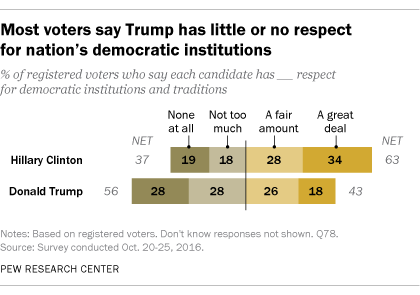 Moreover, 56% of registered voters say that Trump has little or no respect for the “nation’s democratic institutions and traditions,” compared with 43% who say he has a great deal or fair amount of respect for democratic institutions and traditions. Far more voters think Hillary Clinton respects women, minorities and the nation’s democracy. And nearly twice as many describe Clinton as “well-qualified” than say that about Trump (62% vs. 32%). Yet concerns over Clinton’s honesty persist, and just 35% say that, if elected, she would make a good or great president; even fewer (27%) think Trump would make a good or great president. These views have changed little over the course of the campaign. The latest survey by Pew Research Center, conducted Oct. 20-25 among 2,583 adults, including 2,120 registered voters, finds broad agreement about the importance of some aspects of democracy, such as fair and open elections. But there are sharp divisions over whether other aspects are very important to maintaining a strong democracy – notably, that losers of elections recognize the legitimacy of the winners and that news organizations are free to criticize politicians. Overwhelming majorities of Clinton (93%) and Trump (91%) backers say it is very important that national elections be open and fair. 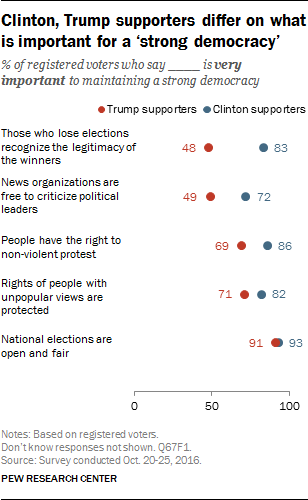 Large majorities of both groups also say it is very important that the rights of people who hold unpopular views be protected (82% of Clinton supporters, 71% of Trump supporters). However, Clinton supporters (86%) are more likely than Trump supporters (69%) to say it is very important that people have a right to non-violent protest. And while sizable majorities of both Clinton and Trump supporters view electoral concessions as important, Clinton backers (83%) are far more likely than Trump supporters (48%) to see this as very important. Trump voters also are far less likely to say that the freedom of the press to criticize political leaders is essential to maintaining a strong democracy. Only about half of Trump supporters (49%) view this as very important, compared with 72% of Clinton supporters. While Trump voters attach great importance to fair and open elections, they are skeptical that the upcoming election will meet this standard. Just 43% have a great deal or fair amount of confidence the presidential election will be “open and fair,” while 56% have not too much confidence or no confidence at all that this will occur. More than twice as many Clinton supporters (88%) as Trump supporters are confident that the upcoming election will be open and fair. Currently, 62% of voters say Trump has been too personally critical of Clinton, which is about 10 percentage points higher than the previous peak (53% said that about Bob Dole in 1996, 52% for John Kerry in 2004). Just 36% say he has not been too critical of Clinton. By comparison, 44% say Clinton has been too personally critical of her opponent, which is higher than the share saying that about Barack Obama during either of his campaigns. An increasing share of voters believes that insulting political opponents is “sometimes fair game.” Most voters (54%) say it is “never fair game” for politicians to insult their opponents, but 43% say insults are sometimes acceptable, up from 30% in March during the presidential primaries. Among voters in both parties, more view political insults as acceptable than did so in the spring. Today, 48% of Republican and Republican-leaning registered voters say insulting opponents is sometimes fair game, up from 38% in March. By comparison, 37% of Democrats say political insults are sometimes justifiable, a 12-percentage-point increase since then. Meanwhile, most Clinton supporters not only take a dim view of Trump, but say they have a hard time respecting the people who support the Republican nominee. 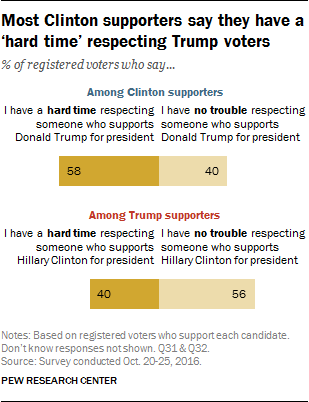 Nearly six-in-ten Clinton supporters (58%) say they “have a hard time respecting someone who supports Donald Trump for president.” Just 40% say they have “no trouble” respecting someone who backs Trump. Trump supporters are less likely to say they have difficulty respecting Clinton voters. Four-in-ten (40%) say they have a hard time respecting Clinton voters, while 56% say they have no trouble doing so. Most voters expect current political divisions to persist after the election, no matter who is elected president. Just 17% of all voters expect the nation’s political divisions to decrease if Trump is elected. Most say they will increase (55%) or stay the about same (26%). Even fewer voters (9%) say political divisions will lessen if Clinton becomes president; 41% say divisions will increase if she is elected, while 48% say they will stay about the same. How much do the candidates respect women, other groups? Majorities of voters say Trump has a great deal or fair amount of respect for several groups in the population, including men (82% great deal/fair amount), white people (83%), veterans (63%), blue-collar workers (58%) and evangelical Christians (59%). But fewer than half of voters say Trump has a great deal or a fair amount of respect for blacks (42%), women (38%), Hispanics (35%) and immigrants (30%). In each case, majorities say he has little or no respect for these groups. Majorities of both men (58%) and women voters (62%) say Trump has little or no respect for women, but women are more likely than men to say that Trump has no respect for women (43% vs. 29%). Just 28% of voters say Trump has a great deal or fair amount of respect for Muslims – and nearly half of voters (47%) say he has no respect at all for them. Overall, majorities say Trump has a great deal or fair amount of respect for just five of the 12 groups included in the survey. By contrast, majorities say Clinton has a great deal or fair amount of respect for 10 of the 12 groups. The gaps in perceptions of Clinton’s and Trump’s respect for Muslims, women, immigrants and Hispanics are striking: More than twice as many voters say Clinton has at least a fair amount of respect for each of these groups than say the same about Trump. More voters say Trump respects men than say that about Clinton (82% vs. 65%). And while 59% say Trump has a great deal or fair amount of respect for evangelical Christians, fewer say the same about Clinton (51%). Both Clinton and Trump get low marks from voters for how much they respect the opponent’s supporters. Only about a quarter of voters (28%) say Clinton has a great deal or fair amount of respect for people who support Trump; more than twice as many say she has little or no respect for Trump voters. Views of Trump’s respect for Clinton voters are fairly similar: 26% think he has at least a fair amount of respect for Clinton voters, while 71% think he has little or no respect for them. With less than two weeks to go before the election, 46% of registered voters favor Hillary Clinton or lean toward Clinton, while 40% support Trump or lean toward Trump; 6% back Libertarian Gary Johnson, while 3% support Green Party nominee Jill Stein. Earlier this month, Pew Research Center announced it will not be producing likely-voter estimates of the race or making a final projection of the popular vote. This report is based on registered voters or, in some cases, the general public. Most Clinton voters now say they consider their choice a vote “for Clinton” rather than “against Trump” (57% vs. 41%). But just 45% of Trump supporters say they are mostly voting “for” him. In the prior four election cycles, majorities of GOP candidates’ supporters viewed their vote more in positive, rather than negative terms. Overall, Clinton is viewed much more positively than Trump on several key character traits: Far more voters describe her as well-qualified than say that about Trump (62% vs. 32%), and the gap is nearly as wide in perceptions of whether each is “reckless.” Roughly seven-in-ten (69%) describe Trump as reckless, compared with 43% who say this word describes Clinton. About half of voters (49%) say Clinton is a “good role model,” compared with 25% who describe Trump this way. More also view Clinton than Trump as “moral” (43% vs. 32%). However, just 33% say Clinton is honest; a slightly larger share (37%) say this term applies to Trump. And sizable majorities say two negative descriptions – hard to like and having poor judgment – characterize both Clinton and Trump. There is only one trait, among 10 included in the survey, on which majorities view both candidates positively: An equal share say Clinton and Trump are patriotic (61%). 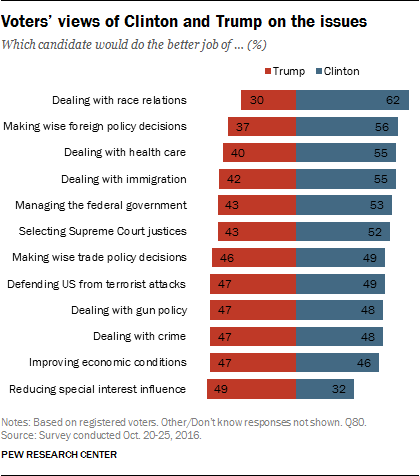 Clinton has sizable advantages on several issues, though Trump runs even with her in dealing with the economy, terrorism, trade and crime. Majorities of voters say Clinton would do a better job on race relations (62% vs. 30% for Trump), making wise decisions on foreign policy (56% vs. 37%), dealing with health care (55% vs. 40%) and selecting Supreme Court justices (55% vs. 42%). Trump holds a significant advantage on only one issue: 49% say he would do a better job of reducing special interest influence. 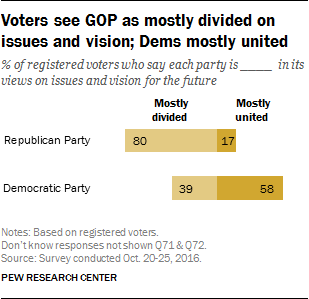 GOP voters see a divided party. In the view of most voters – including most Republicans – the GOP will face the election deeply divided. Fully 80% of registered voters say the party is mostly divided in its views on issues and vision for the future, while just 17% say it is mostly united. Seven-in-ten Republican and Republican-leaning voters say the GOP is mostly divided, as do 89% of Democrats. ACA continues to be divisive. Currently, 45% of voters approve of the 2010 health care law, while 53% disapprove. For more on the health care law, including views on whether Congress should repeal or expand it, see Pew Research Center’s Fact Tank blog. Trump voters more likely to view Russia as “not much of a problem.” Similar shares of Clinton and Trump supporters view Russia as an adversary (29% of Clinton supporters, 24% of Trump supporters), but Clinton backers are 13 percentage points more likely to say Russia is a serious problem (53% vs. 40%). And while 30% of Trump supporters say Russia is not much of a problem, only 13% of Clinton backers say the same. Majority says abortion should be legal in all or most cases. Overall, 61% of voters say abortion should be legal in all or most cases, while 36% say it should be illegal in at least most cases. About eight-in-ten Clinton supporters (82%) say abortion should be mostly legal; a smaller majority of Trump supporters (60%) say abortion should be illegal in all or most cases, while 36% think it should be mostly legal. Clinton being held to higher standard because of her gender? About half of voters (51%) say that Clinton’s gender has not been a factor in how she has been treated during the campaign; 30% say she is being held to a higher standard than past presidential candidates because she is a woman, while just 17% say she is being treated less critically. Overall, women (38%) are somewhat more likely than men (22%) to say Clinton is being held to a higher standard. Obama job approval at 54%. Obama’s job rating among the general public is little changed from August (53%), but stands at its highest point since December 2012, a month after he won reelection. Obama’s job rating has been in positive territory for most of this year.